Use the tabs below to navigate to user Q&A and other useful sections. This section provides an overall summary of our review of the magicJack Plus phone service. Scroll down to read the complete review, including ordering, installation, using the service and returning. The magicJack Plus is very simple to acquire, setup and also has three (3) different ways to utilize the service (computer, home phone, and mobile). The biggest plus is the low cost of service, a fraction of a typical landline cost. This device and service lends itself very well for a cheap second line or for people who are not that reliant on a home phone line (e.g. someone who uses their cell phone for most conversations). There is no customer support to call if you have issues but they do have online chat and a knowledgebase. This would be more of a concern for less tech savvy people who like the comfort of knowing that help is just a phone call away. The feature set is minimal compared with other VoIP services available. There are also a few annoying points with the magicJack mobile application. Cost: $39.95 for the magicJack Plus device which includes 6 months free phone service. Service Plans: Monthly plan costs $5 per month, 6 month plan costs $20 every 6 months, 1 year plan costs $35 per year and their 5 year plan costs $120 every 5 years. Extra fees apply for some features (e.g. porting your number) plus applicable regulatory fees and taxes. Extra fees apply for certain national area codes plus international calling. Overlooking the nuances about the magicJack Plus, it is actually quite a neat product. Setting up the device is a little obnoxious but after you survive the deluge of ads, what lies beneath is an acceptable calling solution. Worth considering if you are comfortable with technology and cost is a major driving factor over anything else. A lot of easy-to-use VoIP calling solutions have made their way to the market. A variety of solutions have surfaced both as an attempt to meet the needs of the everyday consumer as well as enterprises. 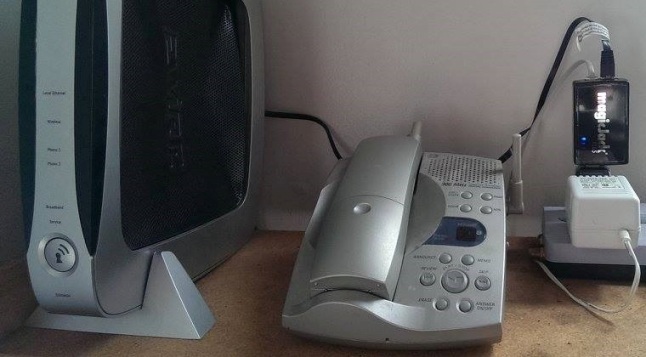 These simple devices and applications allow people with an Internet connection the ability to make a voice call without an actual landline. One very low cost solution is the magicJack Plus. MagicJack first hit the market in 2007. The original version was a small USB device that plugged directly into a Personal Computer (PC) and allowed a standard telephone to be plugged into the device. It utilizes Voice over IP (VoIP) technology, allowing users to make internet-based phone calls. MagicJack Plus was introduced in 2011 to remove the requirement of connecting directly to a PC, instead connecting directly to an available internet port (modem, router etc). The company behind the MagicJack products is YMAX Communications Corporation, who provide the transfer of the phone calls made with these products. Many people have heard of MagicJack as it is promoted through commercials on television. It is a very low cost option, with a small annual charge, for making unlimited calls in USA and Canada (note that certain fee type codes and some area codes may require prepaid minutes to be purchased though). A 30-day money back guarantee is offered for those who want to try it out with no risk. We decided to take the magicJack Plus for a test drive to see how it performs, including ordering, setting up, using it, trying customer support and returning the device. Though you can find the magicJack Plus in many consumer electronics stores, we went ahead and purchased the device through the company's website. We selected the expedited shipping option for an additional $8.95 so the device would arrive between 3 to 5 business days. However, the device arrived 9 days (7 business days) after ordering, causing us to deduct a star. If you are someone who is easily offended by "up selling" tactics, I would avoid ordering the device online. After you register for your free trial, magicJack bombards you with a deluge of add-ons for your order. Some of the offers do make some sense though if you were planning on keeping the service. However, it still feels like a high pressure sales situation so we knocked a star off for these tactics. The below image shows an example of some of the ads. The cost for the magicJack Plus device is $49.95 and this includes six (6) months of service free (unlimited calling to the USA and Canada). They also promote a 30 day money back guarantee, excluding shipping fees. Like any phone solution, VoIP or landline, additional fees apply to make international calls. Unless you are calling another magicJack subscriber, you are subject to certain fees for numbers outside of the coverage area (including some national area codes). Fortunately, their rates are fairly low (it differs by country.) These fees can only be circumvented if a person you are calling in another country is also using magicJack. If you're really trying to beat the system, you can also assign a local number to a unit and send it to someone over seas. Here is an image of the package once it arrived. There are three (3) main ways that the magicJack Plus device and service can be used, as follows. However, option 1 below is required to configure your service before you can make phone calls. You can connect the device directly to a computer via the USB connector. In this scenario you can use what is known as a "softphone" application, which includes a piece of software that turns your computer into your phone dialer. You will then need a headset, or separate microphone and speaker set to make calls. You can also plug any analog, touchtone phone to the device for a more authentic experience. The magicJack Plus device can plug directly into your Internet modem or router, which is the easiest way to use the device if you want to use a regular phone. For various set-up options with your home network we recommend reading our set-up article. There is a free mobile application (App) available on Google Play and Apple App Store which gives users a highly mobile option to use the service as it can function on 3G or higher networks or over Wi-Fi connections. Perfect for modern day smartphones. No matter how you use it, you have the ability to access voicemail. Fortunately, you don't have to fine tune anything (nor do you have the ability) as you simply plug in the device, provide requested information and you're good to go. Next, lets look at the different ways to use it as introduced above. Installation can be a pain point for some users who are not technology comfortable so we will walk through this. The device utilizes a USB 2.0 connection to interface with a computer. Since Windows commands a majority of operating systems in the market, we installed and tested the device on a computer utilizing the Windows 7 64 bit operating system. 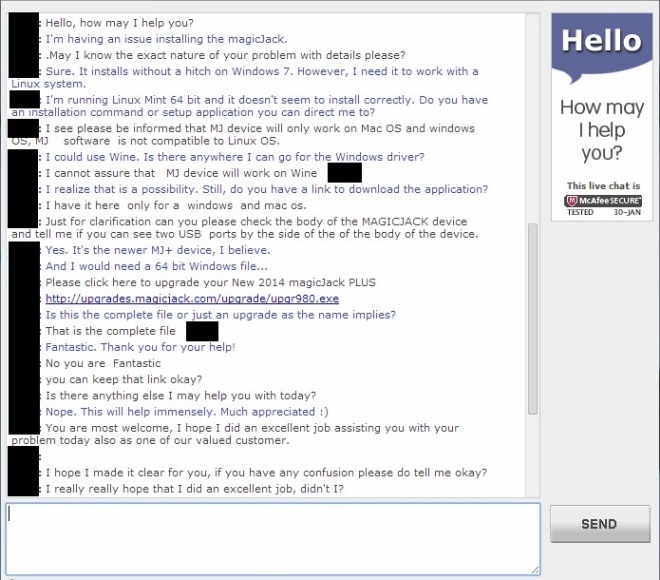 When you plug the magicJack into a USB port on your computer the driver automatically installs. One quick note here is that the device includes two additional USB ports which can be very useful as the device depth means it can cover multiple ports on your computer device. If you have not already registered the device you will need to now. You have to work through a few web forms to setup the device and register a valid phone number. Be prepared: the same offers you encounter when ordering the device come back for a second round of promotional assault. 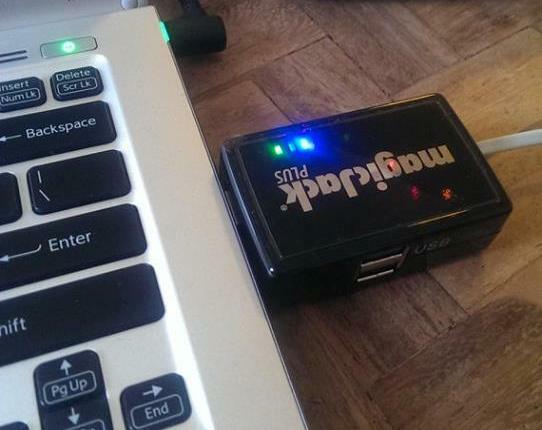 The below image shows the device connected to one of our laptops. You can request an area code for anywhere in the US or Canada which is a free feature of magicJack Plus. Additionally, it is possible to port an existing number to the service or you can optionally create a vanity number (subject to availability, of course) both for an additional fee of $20 plus $10 a year annually. Note: we typically recommend not porting your existing phone number initially until at least you have used the service and are happy with it. We recommend this for any VoIP service you may be considering. Once you have named your device, selected a valid number and shuffled through all the promo's, you are ready to make calls. The below image shows the phone dialer on the computer screen. The magicJack application you see above is the softphone you can utilize to initiate phone calls. If you dont have a phone connected to the device then you will need a headset or microphone/speakers combo as mentioned previously. Just like every phone since the rotary phone went to the wayside, you will see a familiar number layout. You use this dialpad to dial the phone number you want to call and click on the "send" button. To end the call you simply click on the "end" button. You can also connect your existing home phone to the magicJack Plus device in this configuration. Connecting a phone to the device is just as simple as connecting a phone to any other RJ-11 socket in your home or business. If you're using an actual phone, you can also use it's number pad like any other phone, just pick it up and dial the number you want to call. We made a few test calls with this set up and found the sound quality as good as a landline, with no noticeable hum, echo, or static noises in the background. Depending on how you plan on using the magicJack device, this option works OK but it is somewhat clunky and space consuming, especially when using a laptop. It also requires the computer device to be on and running for the phone service to work. Fortunately, the Plus device includes other ways to use the service as well. Another way to use the magicJack Plus is by plugging the device directly into an Internet modem or a router Internet port. The device includes an adaptor for the USB connector to plug into a 120V mains socket to power the Plus device (similar to a smartphone power adaptor). Your analog phone will plug into the RJ-11 port just like when using the device with a computer. Then you will use the phone in the same way as if it were a landline. The below images shows the magicJack Plus device connected to a mains outlet and then a cable connected to a router and a cable connected to the phone (3 connections in total). The device will protrude if connecting directly to a mains outlet, so it is best to avoid plugging it into a socket in a high traffic area. Alternatively, the device does include a USB-power extension cable. This setup is likely the most commonly used. However, when performing an initial setup it is probably simpler to start with the device connected directly to your computer and then move to this setup once complete. We recommend setting up 911 service as soon as you can, which must be configured through a separate verification process, especially if this will be your main home number. This magicJack application is one more way you can utilize this service. For someone with limited minutes on a carrier plan, this is the perfect way to add virtually unlimited minutes to your cell calling plan. It works over both Wi-Fi and 3G or higher mobile data networks. The image below gives you an idea of what the app looks like on a smartphone. Though the magicJack application is a great a value add-on, we did notice a couple of minor issues we should mention. The first one was that when going to download the app the icon presented is a green square with the words "Talk Free" in white. This App icon looks nothing like the rest of their branding and we almost didn't download the App as we were not sure it was truly for magicJack. The second issue we encountered with the application has to do with the contact integration. For Android, after selecting a contact in the magicJack application, you are taken to the actual phone's contact database. If you attempt to make a call from here, you will simply utilize your actual phone and not the magicJack application (so using your phone minutes rather than free calling). Many VoIP App's, for example Skype, integrate further into the Android OS such that they appear in a prompt that allows you to select your phone, Skype or another application to call the number you select - magicJack does not. Though the magicJack app has some flaws, it is a nice add-on feature and does work for making phone calls. The sound quality was no worse than a typical phone call made from your cell phone. The 4G network in the area where we tested the phone App is very good so that would have helped. As a VoIP product and service, the magicJack Plus is considerably light on features. The included call features are voicemail, caller ID, call forwarding and call waiting. They do also boast free 411 calling. However, these are basic features when compared to many other VoIP services available today (some with 40+ features). As mentioned previously they do allow number porting, but at an additional fee to switch ($20) and then annually to maintain ($10). A fee for porting your existing number is common though (due to "paperwork" involved). The customer service options are detailed in the tabbed section above titled "Customer Support". This is a very low cost service so it's not surprising that there is NO phone support. They do have a knowledgebase on their website which includes some "how-to" videos and frequently asked questions, as well as a live chat option. This is the meat of the conversation - the rest of the unseen messages primarily consist of profuse appreciative statements from the live chat person. We were also presented with a link to claim a 5 year contract extension for a grand total of about $70. In a nutshell, the live chat person was able to provide an answer even though it was a somewhat obscure request. This is just an example and of course does not cover all scenarios so is not necessarily a true representation of their support as a whole. The only remaining item to test was returning the device. This can be an important step for those who decide it is not for them during the trial period. Returning the product was straight forward and simple we are glad to say. It consisted of entering in a little information, confirming that indeed we wanted to cancel and then getting an RMA authorization to include in the return shipment. Overall, we had a positive experience with the magicJack Plus device and phone service. The sound quality was acceptable during our testing, although it must be noted we have a high quality Internet connection. The main strength and attraction is quite clearly the low cost. If cost is your only priority then this service is worth considering. The weaknesses include no customer service phone line and the reduced feature set compared with typical VoIP services in the market today. There are also some quirks with the mobile App, although it is a nice feature to have and does work. Based on it's low cost we would certainly recommend this device to anyone who was looking for a second phone line that was not for critical use. If you are considering this option for your main home phone line then we recommend you consider what is important to you most (cost, customer service, features etc) and to also look through the user submitted reviews before making your decision. From the over 70 user submitted reviews below since 2008 you can see a mixed reaction of experiences. One of the biggest complaints is related to customer service, which is only available through live chat on the website (click on the customer service tab for more information). However, for the very low annual fee its hard to see how CS could be extended without adding more cost to the end user. Overall, the user's average rating is "OK". Please browse through the reviews below or add your own based on your experience. magicJack reviews are listed in chronological order. Don't think that your number will be able to transfer to your MagicJack. There are some area codes that MagicJack does not have access to. Make sure you check first! I have been using the MagicJack for years now and I think the quality is dam good and so is the price and even the installation is a breeze, I mean who can't plug a USB port into a computer or router, because that's all there is to installing it. Why pay those VoIP companies $20 plus a month when you're already paying for your Internet service and that's all the VoIP companies are doing is leasing you their equipment because it runs off your Internet service. Ordered MagicJack Go online with a full year free. In the setting up process I was never issued a number and check to see if my old number could be used. Their online checker said the number was good so I paid the 19.95 to have it ported. Then I received an email stating that they could not port the number. I called to ask them what am I to do about a phone number and all they could tell me was to pay ten dollars to have it changed, but I never received one in the first place. Now I have a phone service I can only call out and not receive calls. They ripped me off for $22.00 for the porting that they did not do and now they want another $10 for a number. I have been with them for over 10 years and my adapter broke - the USB connection finally pulled out of the circuit board adapter. Customer service were of no help. They got me so annoyed and I still have a year to go with them. Five year plan for $100 is great value! But no more. I will switch. The service has always been good - replaced my AT@T landline in 2006 and have been very happy with it. Typing this now I may reconsider but I have no phone. No cell, no landline and I need to call my 82 year old mom and I can't. So I'm a little frustrated. That's my problem but customer service did not understand what went wrong. Poorly trained. I have been using MagicJack for years with a regular desk phone with 2 wireless extensions. Good sound and no problems except for one contact. My Mother. For some reason after moving from Illinois to Arkansas every time my Mother calls me it hangs up once and then when she calls back it's fine? Inexpensive and I have only had to replace the adapter once in 8 years. Why is Magic Jack so annoying? 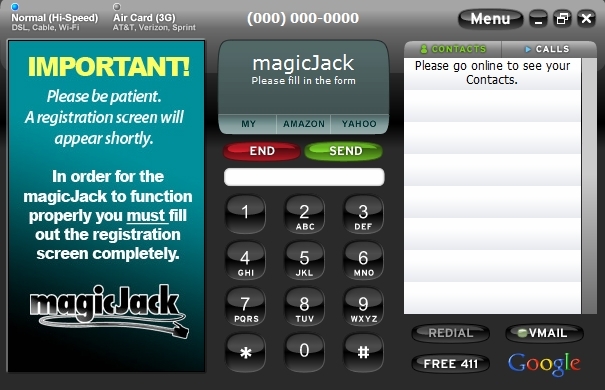 The only bad things I can say about MagicJack are these: The dialer constantly pops up and there is no way to prevent it. I don't need this aggravation being posted over my open screen every time I answer the phone or want to make a call! The other is, why are they constantly trying to get me to pay for a 911 service that is provided to me with my tax dollars? Scam to make a few bucks more? Just like Walmart! Other than that it works very well. MagicJack has gone down hill in the last few yeas. I have been using them for over 5 years. The voice is hard to hear on most calls and technical support which is only a chat line is very poor. Most so called technical reps cannot work out of the box. If you have an issue, they are taught only to try certain things and nothing else. This may take several hours of your time and poor voice will never be cleared up, at least in my case. So I cannot recommend them any longer. Ready to go for the 7th year! I'm about to renew MagicJack for the 7th year! Do I have to say the reason? I had only one problem when it didn't want to start on Win8 or Win10 and I read solution on the Internet and now have two shortcuts on my desktop. If one doesn't work that means I have to click on another one (direct one):) Since I don't reset my computer more than once a month even that is not a big deal. If sound quality is bad I close some programs on the computer and it's better. I'm thinking of getting this year the MagicJack Go to try it but I don't see info about it... like can I send texts or not... That is all. Have had Magicjack for 4 years. Paying $35 dollars a year for landline service as opposed to $50 a month before! Only problem is when my Wi-Fi provider has problems but this is no fault for Magicjack. Great way to save money! I have been a long time customer, since 2011. My device doesn't work. They want to charge me a years worth of service for a functional device. I still have many prepaid months left from the last purchase. If they honor their customers so much why scam them for a new device instead of being grateful for their business? Their product is crap... I have not had reliable service for MONTHS. ...but what is worse is their customer service... absolutely WORTHLESS! Homer (February 5th 2019) : Magicjack devices don't last forever. I am on my third. They are heat sensitive. The call quality is as good as your Internet service. Choppy Internet service (hello, Comcast) gives drop outs and hangups. I took mine to India on a biz trip; called US and people couldn't tell I wasn't home. When device starts limiting the time of your calls, it's starting to fail and just get a new one - and keep that one cool. I keep a small fan on my cable modem, wi-fi router, and Magicjack device. This last one has lasted over 7 years, whereas the others lasted maybe 3 without cooling. App works better than the phone plugged in directly - because a fast Internet chop will directly affect device, whereas the wi-fi version on cellphone might (MIGHT) glide over the chop. If you have good or excellent Internet service, and keep your device from overheating (<72 degF in still air or use a fan) you should be very happy with it. Disclaimer: The opinions, views and ratings expressed in these VoIP Reviews are those solely of the reviewer who submitted the review. Whichvoip.com does not necessarily agree with any of the expressed opinions, view or ratings. MagicJack phone service has received some mixed feedback regarding customer service, from users who have submitted feedback to WhichVoIP. The table below summarizes the existing options for MagicJack users to get either self help from the MagicJack website, or support from the customer service department. Please contact us if there is any information in the table below that you believe should be updated. I have been a residential and office MagicJack subscriber (2 sets) since 2007 and have been well-served the entire time. We found sound quality/clearness superior to our previous AT&T land line and have never regretted the change. For a single person office or residential line, Magic Jack has provided every service needed. My only disappointment is that they have discontinued the 5-year block purchase. The maximum is now 3 years. I have used Ring Central and it truly offers an amazing array of features, but is extremely cumbersome, in my opinion. I've been using MagicJack for a full 6 years and now I want to renew for the 7th time but at same time I want to get Magic Jack GO. Can I use it on computer and mobile too or just a mobile? Can I send text messages with GO? I have to renew in 7 days I think - will MJGO arrive before old one expire? And thank you again... you helped me a lot for the last 6 years. -> Response: Yes you can use it on a PC and use the app on a mobile and yes text messaging is available too but only from the mobile App. I can't answer regarding shipping time, maybe if through Amazon. I read that Magic Jack does not have to be connected to a computer. Is this true? -> Response: Yes that is true. The old MagicJack device had to be connected to a PC but the newer ones can be connected to a PC or used standalone. Installed magicjack 3 months ago, and have sporadic "breaking up" of conversations. Have purchased new cordless phone set with all new handsets, and upload bandwith is 782 kbps, which is 5 times required. All connections are secure and snug fitting, and device is hooked directly to wireless modem. Please help. -> Response: When it breaks up is it both directions or just 1 way e.g. uplink to the other person? Please run our voip test and let us know the results. Also ensure nothing else is running on your Internet at the time, as a test. Limited bandwidth by the sounds of things which may be causing issues if other devices using your Internet at the same time. I want to use the Magic Jack for incoming Fax. Fax is currently on a LAN line. Can I just plug in the Magic Jack into the Router and Fax into the Magic Jack? -> Response: You should be able to connect the MJ to your fax machine instead of your analog phone and it will receive your fax. Faxing over the Internet is not as reliable as landlines and MJ does not officially support this but usually it is successful. Do I have connect my router and answering machine to the Magic Jack? -> Response: You need to connect the MagicJack to your Internet (could be direct to a modem or through a switch or router). Magic Jack has voicemail and voicemail to email so no need to use your answering machine. If I purchase the newest MagicJack, can I use multiple phones? -> Response: Yes you can. The easiest way is to use cordless phones. Alternatively connect to your home internal phone wiring and use phones throughout the house. You just have to be careful with the landline coming into the house in the second case as it is powered by the old landline provider so really should be disconnected at the side of the house. i currently have a MAGIC JACK device and the quality is TERRIBLE!!!! The people on the other end ALWAYS tell me there is a beeping sound like I am pressing the buttons. Also they tell me the calls fade in and out. So as you can see I am VERY leary in purchasing another VOIP service but I can not stand to use this MAGIC JACK one more day!!! I am on a limited budget and sometimes it will be days before my phone rings. I also don't use it much to make outgoing calls either nut I still want piece of mind in having a land line phone. Please advise me as to what plan would be best for me. Also, if it ends up being the quality of the MAGIC JACK I now have will I be able to return it if I am not satisfied? -> Response: Try running our VoIP test to see if there is an issue with your Internet connection. This may be the issue rather than MagicJack so worth trying this before looking at any other provider. Many providers offer 30 day cancellation. We normally advise running the VoIP test, then choose a provider that has the option to cancel and when you order, choose a new phone number. Test the service and if happy port any existing numbers over. This tends to ensure a hassle-free approach. Can I get my existing CenturyTel number transferred to Magic Jack? -> Response: You should be able to. There are a few corner cases but it is usually fine to port your number over. A word of warning though, don't cancel CenturyTel until the port has been done as otherwise you could lose the number. Also I would recommend testing the MJ service first to make sure you are happy with it before doing the number transfer. 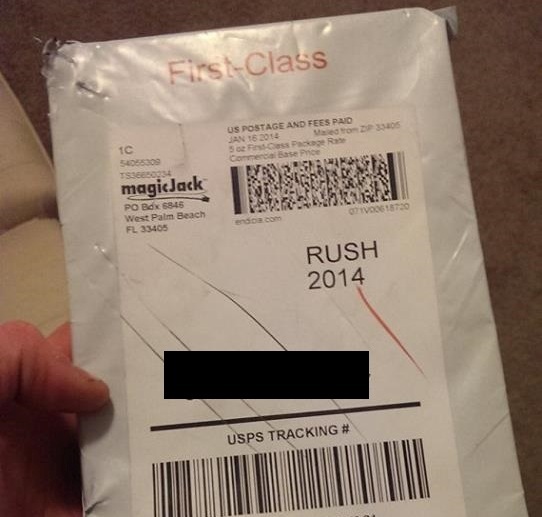 I recently signed up with MagicJack and am totally satisfied with their service and support. Setup may be complicated for some, but their online support will talk you through any problems you encounter. My son, who recommended MagicJack to me has been using them for 3 years with no problems.